Blood will tell – and the best proof for a stallion is the quality of his offspring. The stallion Magic Magnifique, proudly owned by Sweden Arabian Stud, is the sire of twice Gold Champion Filly Foal KA Wahidah; a magic and magnificent experience for her breeder and owner Nadine Koo. KA Wahida out of Wolante by Wojslaw has not only won the championship at the national and international C-Show she also became Best Dutch Horse! “The spirit of the Arabian Horse Weekend is different. People often say how much they like this show because of the family atmosphere,” says Annelieke Stoop from the organizing Stoop family. “We have a full VIP area with delicious food, everybody is talking and congratulating each other.” Finally the organizers were lucky with the weather. Last year the weather was a factor for the show, several classes had to be stopped because of heavy rain. This year sunshine accompanied the whole event with more than 225 horses. Forelock’s Arabians received many sincere congratulations at the national c-show. The stud farm was establish back in 1972 by Aad Kuijf’s parents and is now run by Aad Kuijf and Wendy Jane Delvalle, who enjoyed a successful weekend in Sint-Oedenrode. The bay Forelock’s Yupiter, by Forelock’s Shaheen out of Forelock’s Yessy garnered both Colt Foal Championships, too. Forelock’s Yessy achieved Bronze Champion Senior Mares herself and she is also the dam of Forelock’s Yinx, this time by FS Reflection, who won Gold Champion Junior Filly. A very promising filly out of this strong dam line, which became so important for this stud farm. Forelock’s Yinx became second in the choice for Best In Show, bested only by A Kanz Of Kossack. As the name suggests, the bay A Kanz Of Kossack is proudly bred and owned by The Kossack Stud, another globally renowned stud farm with a long tradition in the Netherlands. After winning Bronze Champion Yearling Colts at the Tulip Cup a few weeks earlier, A Kanz Of Kossack now went away with the Gold Champion Yearling Colts and the title Best In Show. His sire Kanz Albidayer, combining the breeding heros WH Justice and Marwan Al Shaqab, needs little introduction. A Kanz Of Kossack is out of the Aja Shakahan daughter Ariel tracing back through Malta – Malwa to Mammona. Gold Champion Senior Mares became ZK Marazja, a Marcipan daughter out of AF Zjaba by Kubay Khan, representing mainly Russian bloodlines. The eleven years old bay mare is bred and owned by E. A. Loots. Silver went to F&M Karmaya, a Kubay Khan daughter out of Ya Karma, bred and owned by F&M Arabians. Abha Qatar is the sire of the Unanimous Gold Champion Senior Stallion Fysio’s Arabian Matiullah-Khan, bred by N. van Geloven. The dam is Zarqa Moefezaa’a, sired by former World Champion Stallion Hlayyil Ramadan. Yanour Hayati, bred and owned by Yildiz Arabians, won Silver with Fadyn ‘W’, bred by B. Blaak and owned by A. Bruijs-Laylayan, garnering Bronze. Eromanov T is the name of the proud Gold Champion Gelding, bred by L. Schultrups and owned by Emmie Graafland. The five years old bay Eromanov T already won Bronze Champion Gelding at the Tulip Cup, Jesse Swanepol at the lead, and is exclusively bred. His sire is Marhaabah, the extraordinary son of U.S. National Champions Marwan Al Shaqab and Shalina El Jamaal. Marhaabah has achieved tremendous success in the show ring and so does his son Eromanov T. The dam of this fine gelding is none other than Rigona by Abakan. Rigona is also the dam of champion winning Karona, by Karat, and Kupona, by Kupol. At the international show, Eromanov T became Silver Champion Gelding, bested by Postar, owned by Flaxman Arabians. Postar – who was the unanimous choice of the judges - was born in Janow Podlaski and is a son of Om El Bellissimo out of Pomerania, a granddaughter of the immortal Pilarka. Al Juman Stud is the proud owner of Unanimous Gold Champion Yearling Filly, Sheikha Al Juman. A steel grey beauty, bred by B.M. Arabian Stud, sired by RFI Farid out of PF Panama by WH Justice. The Emerald J daughter Merida J, bred and owned by Jadem Arabians, won Silver and Layla NK, by TH Hamza, bred and owned by NK Arabians, Bronze. Jadem Arabians is also the proud breeder and owner of the Unanimous Gold Champion Yearling Colt, Munastir J by Exalibur EA and Bronze winner Galliano J by Shiraz de Lafon. 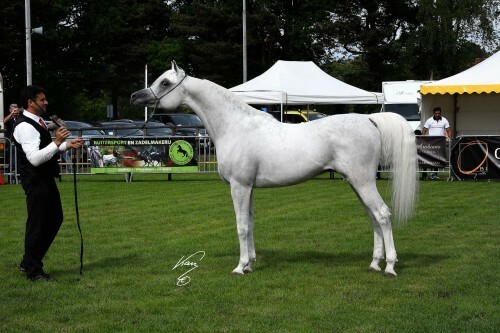 Silver achieved a son of the ethereal Ezz Ezzain: Hanaya Habib El Ezz, bred and owned by Hanaya Arabians, Switzerland. Jadem Arabians’ great stallion Emerald J also sired the Unanimous Gold Champion Junior Colt Gaudi J. 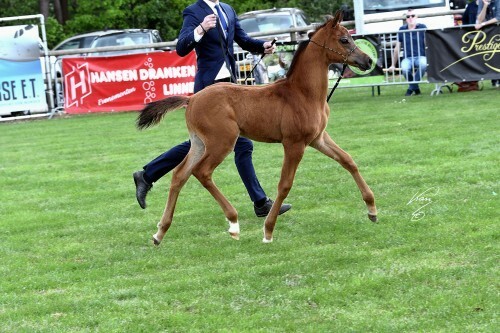 Gold Champion Junior Filly Emara AT is a highly elegant bay daughter of Kahil Al Shaqab out of TF Exotikah, bred and owned by Al Thumama Stud, Qatar. The Senior Stallion Championship was again unanimous: Nadeed Al Naif, bred by Al Naif Stud, Qatar, and owned by Hanaya Arabians, Switzerland. The six years old stallion combines the great sires Ansata Nile Echo and Ashhal Al Rayyan and goes back in tail female line to famed Simeon Safanad. But it was the Gold Champion Senior Mare Meshael Al Khalediah who won the title Best In Show. Bred by Al Khaledia Stud, Saudi-Arabia, this refined grey mare is now owned by NK Arabians. Meshael Al Khalediah is by El Palacio VO, himself a son of World Champion Stallion Al Lahab and out of one of the world’s most treasured mares El Dorada. On the female side of her pedigree, Meshael Al Khalediah is out of Ghala Al Khalediah by multi champion F Shamaal out of World Champion Mare Robin K.